Based in Suriname’s capital city, Paramaribo, the birthplace of some of the world’s most revered footballers such as Clarence Seedorf, Edgar Davids and Jimmy Floyd Hasselbaink, Robinhood is a club steeped in history. Indeed, their trophy cabinet is packed with silverware: five Surinamese bekers, five Super Cups and an astounding 23 Hoofdklasse titles. But in recent times their dominance has waned, and now, after finishing bottom of the 2013/14 standings, they will play the new season in the second division, the Eerste Klasse. Something they have never done before. Founded in 1945, the primary reason for the club’s formation was to create community cohesion by offering Paramaribo’s poorest men the opportunity to play football. In an area where money and basic facilities were in short supply, Robinhood began in a barefoot league called the Tweede Klasse. Impressing in the lower levels, their route to the next stage in the pyramid was blocked purely because of a requirement to wear boots; an issue when Robinhood couldn’t afford to buy them. Eventually, two years after the club’s inception, they were presented with a dozen pairs of boots and promotion to the Eerste Klasse. At this time, Robinhood was a team comprised of naturally gifted players with raw abilities, and the people of Paramaribo were captivated, as Robinhood gained the nickname Geen Strijd, Geen Kroon (No Fight, No Glory). The team’s rise to the top was inexorable and in 1949, a mere four years following their creation, Robinhood found themselves in the Hoofdklasse, where all the best sides wanted to be. After finding their feet for the first couple of years, adjusting to the league’s differences, Robinhood were crowned top-flight champions in 1953 in style, sweeping aside well-known competitors Transvaal 5-0. This marked the beginning of a very special period. Jule Gersie was the man who engineered such a triumph, as he was able to mould together a great team which went on to win the title a further three times during his tenure. The legendary figures of Humphrey Mijnals, who, in 1999, was selected Surinamese footballer of the century, and Charly Marbach, represented the timeless quality of Robinhood’s squad at the time. But it was in the 1970s and 1980s when Robinhood really started to gain a stranglehold on the Hoofdklasse, in a golden era which was overseen by Ronald Kolf, perceived as one of the best coaches in the history of the Surinamese game. Otherwise known as “Ro”, he was formerly on the books of Robinhood as a youth team player before leaving for pastures new, but was brought back after scout Andre de Vries recommended signing him. The outspoken Kolf’s time with the club only lasted three years because, according to reports, he “had problems with the technical leadership.” He soon left to join Robinhood’s rivals, Transvaal, but that didn’t last long either, and Kolf then decided to begin training as a coach. Given his first job as boss of Transvaal’s juniors, his side went unbeaten and won the championship. Sure enough, he was entrusted with the role of managing the seniors and that was no issue as Kolf guided them to titles in 1967 and 1968. His impressive work gained the attention of Robinhood, who signed Kolf on the very first day of 1969, and the rest was history. In this glorious era of success, Robinhood ruled Surinamese football with only occasional bouts of interference from Transvaal. From 1971 to 1989, Geen Strijd, Geen Kroon picked up a total of 13 Hoofdklasse trophies. Kolf’s men were fighting on all fronts, finishing runners-up in the CONCACAF Champions’ Cup (now the CONCACAF Champions League) in the 1976 and 1977 campaigns. In the 1980s, the club kept up their pursuit of winning a piece of silverware on the continental stage, but could only manage runners-up again, losing out in the 1982 and 1983 finals. The club enjoyed two decades of glory and waved goodbye to the 80’s by playing Ajax, one of the most well-known clubs on the planet, in a double-header where they won one and lost one. Not only that, but Robinhood also set up its own youth development centre as a symbol of their progression. This proved to be very useful in the 1990s, as the nucleus of the team was taken apart – the inevitable result of success - and key players left for the Netherlands and other places. Robinhood did manage to win another two Hoofdklasse’s in 1993/94 and 1994/95, but sustained success certainly became less assured. At this stage, the academy had been running for around 10 years and had produced some talented players such as Marcel Reidewald, Johan Vorstwijk and Ricardo Anches, but the squad was nowhere near the standard of previous eras. It is important to point out that Suriname football is not-professional, but rather, functions in an amateur way: players receive small amounts of compensation from their clubs on a semi-professional basis. Because of this, the majority of players tend to leave after one year as clubs cannot tie them down for a prolonged period of time. This results in a situation where it is extremely difficult to build a familiar, consistent team. The death of former Surinamese Minister of Sport, Caribbean Football Union President and FIFA Vice President, Andre Kamperveen, also had a significant effect on the exportation of the country’s top players and Robinhood’s downward spiral. 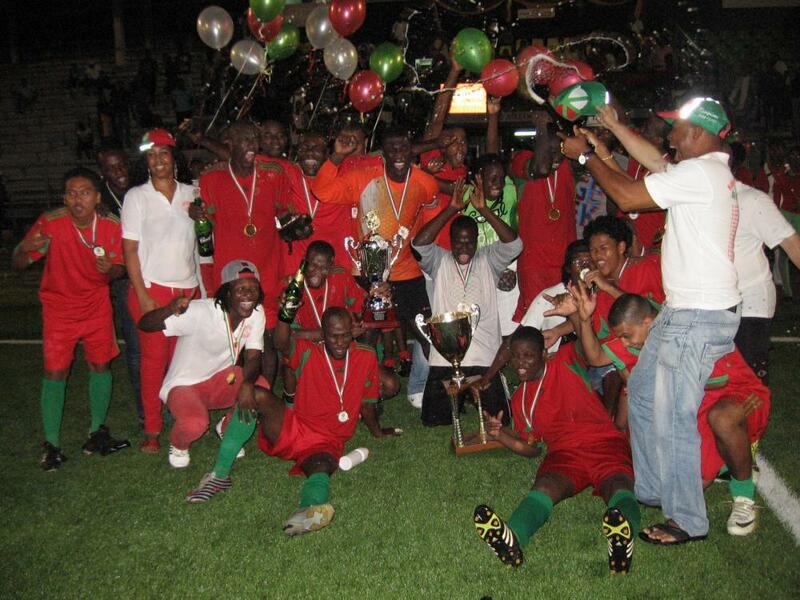 Under Kamperveen’s supervision of football in Suriname, many players fled to the Netherlands and the quality of the Hoofdklasse decreased, leaving teams feeling rather empty-handed. The current chairman, Ludwig Van Dijk, has been in his position for over a decade. From 2000 to 2014, Robinhood has won the title just twice (2004/5, 2011/12). Other teams have come to the fore during this time like reigning champions Inter Moengotapoe – who are harboring hopes of becoming the first Surinamese club to turn professional – and Walking Bout Company. As a consequence of key players and the great Kolf (who ended his long spell as coach in 2003, replaced by Ricardo Winter) leaving, Robinhood have suffered. Their title triumph three years ago was a blip as last season they fared terribly, failing to win a single game in 18 attempts. They conceded 53 goals, the most in the league, and finished 12 points adrift of Boskamp in ninth. The Eerste Klasse is unknown territory for Robinhood and they’ll be expected to go straight back up, back to where their supporters no doubt feel they ‘belong’. Those golden years seem an awful long time ago now. This piece was written by Nathan Carr, who also runs The Home of Caribbean Football. Comments below please.